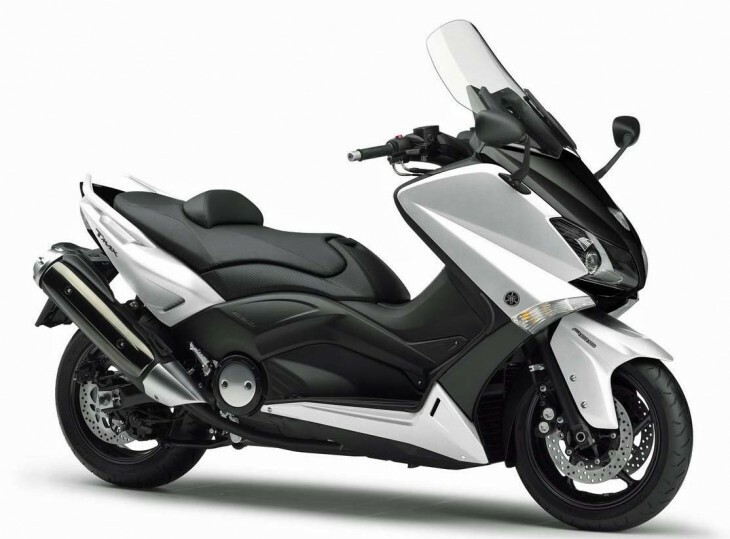 A very busy day in Milan has included Yamaha’s reveal of the new TMAX. 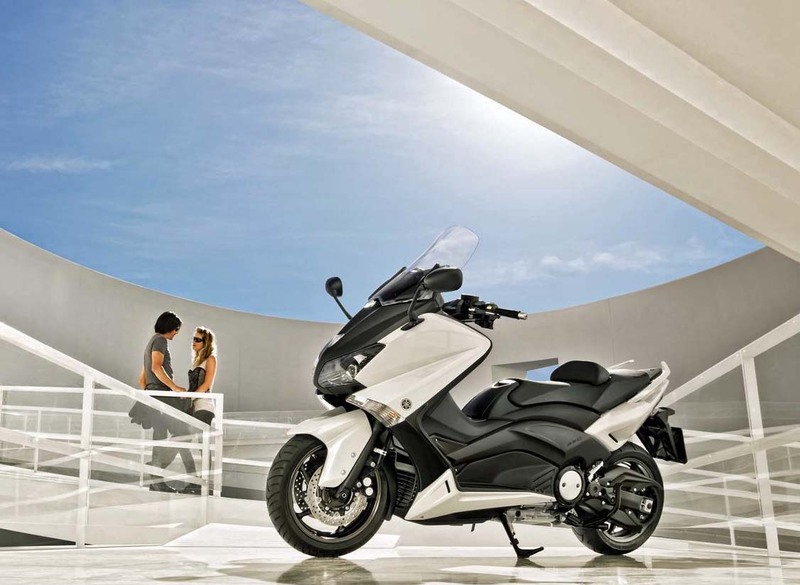 Lighter and more powerful, the 2012 TMAX includes numerous changes and refinements. First and foremost, engine displacement has increased from 499 cc to 530 cc, and “rebuilt with a host of lighter, more efficient components.” Yamaha claims this results in a huge boost in low to mid-speed power and torque. A new belt drive system provides a claimed increase in efficient power transfer together with a more connected feel between the throttle and the rear wheel. Redesigned seating includes more comfortable passenger accommodations and hand grips. A new automotive-style dashboard provides extremely thorough instrumentation with excellent legibility. A larger 282 mm rear disc brake combines with the already powerful dual front brake system. The all-new bodywork includes a two-step adjustable windscreen. 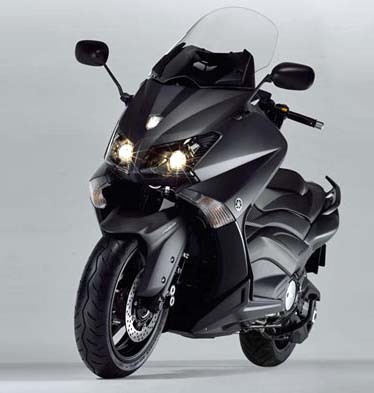 The Yamaha TMAX has previously set the bar for maxi-scooters when it comes to handling, and Yamaha claims improvements in this category, as well. With all the new competition in this segment, it will be interesting to see if the TMAX hangs on to its almost cult-like status among enthusiasts. Te Tmax and the new BMW C 600/650 will set the trend for the coming years: Maxi scooters with 1 or 2 cylinders ranging from 350 to 650 cc, loaded with high-tech features and ready to take on daily commute as well as long road trips. It will be interesting to see between the Yamaha and the BMW, which comes out on top. I run a 2009 TMAX. 6000 Miles this year,22000 Mi showing. Not an issue on anything. I run the snot out of it and not 1 problem. 85mph on the Interstate all day long. 107mph top end on the guage. 50 plus mpg. Wind protection. Cold protection. Smokes the big v-twins. I’ve even seen them wave to me, then catching them selves like they just waved to a guy on a scooter, as I blow their doors off. Amazing bike hope the 530 comes stateside!!! The 2000 ZRX 1100 I owned managed 49.5 mpg cruising on the back roads, could rip to 60 in less than 4 seconds, and ran an 11.5-second 1/4 mile on 87 octane gas. My current 2003 1200 Rex runs a low 11-second 1/4 mile, can rip to 60 in 3.4 seconds, but can still manage over 40 mpg when ridden civilly. Care to go head to head? Oh yeah, and lest I forget, the ZRX 1100 and 1200 *both* have underseat storage, enough to hold a pair of 32-oz Gatorade bottles. I know I’m being a troll about it; claiming victory over a “big v-twin” is like bragging about blowing away a tanker in a Chris Craft. It’s easy to do. Most of those big v-twins weigh over 600 lbs and pack under 100 horsepower! One particularly popular big v-twin runs nearly 1700 ccs, weights in at over 800 lbs, and cranks out just shy of 70 hp. Where the TMAX shines is in the twisties. Equally competent riders, one aboard a TMAX and the others aboard the Ninja 500R, Yamaha Warrior, and VF750 Magna. I’d expect the TMAX to come out on top. In all honesty the TMax sounds like a lot of fun to ride, something I’d probably not think twice about really. I’ve known riders of traditional cruisers made by the Big 4 that were blown away by the large-displacement scooters (i.e. the scooters larger than 250cc). What is the point in comparing an open class street bike to a scooter? The only parameters that you have there that means anything to a potential customer of the T-max is fuel mileage and under seat storage. Was only being a silly troll, nothing more. 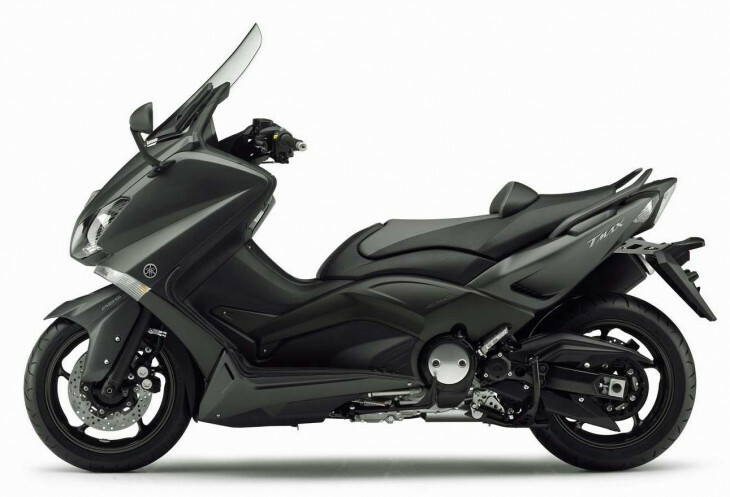 I have no beef with the TMax, I was only being nitpicky about comparing a sporty scooter to the large-displacement V-twin cruisers, that’s all. No real parameters to compare the TMax to a ZRX, Ninja, Warrior, what have you, just a little underwhelmed at beating the large-displacement cruise, which my bone stock 2004 Mach 1 can do, until you get into the more powerful liquid-cooled cruisers. All that drivel aside, I be a turbo could make that TMax a real hoot! Probably even embarrass me on my ZRX at a stoplight. Is it coming to US? I`ve been waiting for a TMAX with ABS for 3 years…. You can easily see where all the motorcycling development dollars are going these days…to the scooters! It’s driven by the fuel prices and isn’t going to slow down any time soon. I would say, at least it is best looking of the bunch. About perfmance and handling, there is no doubt. But still, it is a scooter. Very good, Denny. You are correct, it is a scooter. And your point? Well, you know, I am bit staunch in my views of scooter. To me, no matter how good technically is still not a bike; it is lower grader, period. I’ve an FJR 1300, an R1 and a Super Tenere. I love my motorcycles but for around town/cross town running errands, it’s hard to beat the T Max. The thing is amazing and its 15″ wheels are about the same size as my 1984 FJ1100 had! It has R1 brake calipers. T Max super scooters rock, period. Hugely practical, fun, handle great and plenty fast enough around town. I think I prefer the instrument cluster on my 2009 model. It’s a CVT transmission, why does it need such a prominent tachometer?? I’d much rather have a prominent FUEL GAUGE like in the previous years. That’s my only complaint, though. I LOVE the rest of it. Wish we got it here. Does your 2009 have the bad fuel pump? Do you know if they got these issues worked out? Thanks. Why do cvt transmissioned scooters need a tachometer at all? The rpms are what they are. It’s not like you can downshift or upshift to make the rpms rise or fall. I hate seeing how high my Majesty runs in the rev range (as compared to my motorycles at the same speed). I’d rather it had no tach at all so I didn’t know. 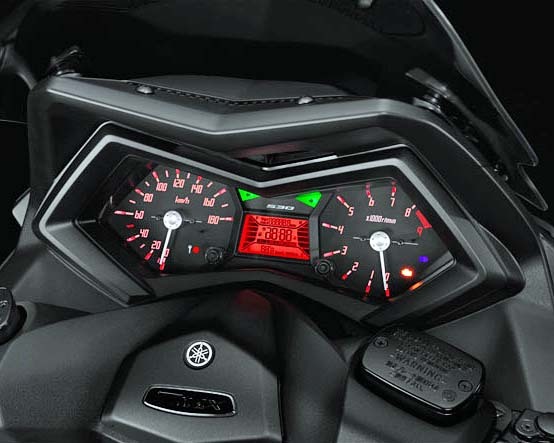 Agree about the instrument cluster, I like my LCD tach and chrome rings and nice big fuel gauge on my ’09. I’ve not had the much mentioned fuel pump issue but apparently it’s just a matter of time? I guess I’ll check in with my service guy and see what he knows. my wife has not had a fuel pump issue on her 09 either and there is no recall for it as far as I can tell on the 09’s. Interesting that Yamaha stayed with a CVT rather than a DCT. And, BMW and Aprilia went with CVTs on their all new maxi-scooters. Did they determine that the CVT is superior or is it simply less costly than a DCT? There sure has been a flurry of automatic motorcycle introductions lately. This looks great, but is it coming to the US? The Yamaha web site does NOT show this scoot as part of the 2012 lineup. Any insight would be appreciated. Nice, though I was hoping for the rumored 750cc triple. Still, I’m looking forward to seeing and riding one soon.